A three-hour long horror fantasy from King Hu finally stored to its full length, the visually stunning wuxia horror-fantasy Legend of the Mountain follows the story of a young Buddhist scholar, Ho Yunqing (Shih Jun, A Touch of Zen) who is tasked by an eminent monk to transcribe a sutra. Ho travels to an isolated mountain in order to complete his work undisturbed and while there he meets a number of strange and eccentric people including the beautiful Melody (Hsu Feng, A Touch of Zen), Mr. Tsui and his friend Chang. Soon malevolent spirits try to steal the sutra from Ho and he finds himself in the middle of a cosmic battle between good and evil. More surreal than straightforward, Legend of the Mountain is most strongly defined by its visual setting. The story is reliant on the setting that Hu luxuriates in at every moment. While the screenplay becomes secondary to what is going on, there is a heavy Buddhist influence in the film that elevates Legend of the Mountain to something quite meditative and spiritual. 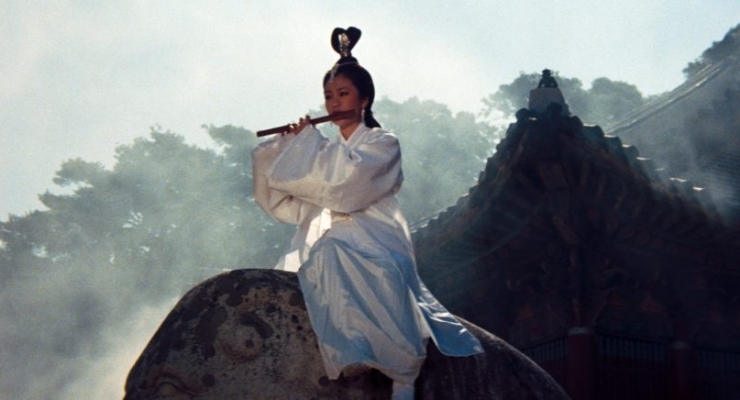 By the standards of today’s wuxia films, Legend may seem quite slow and disappointingly devoid of action and high-flying wire work for younger audiences, but it never disappoints with its gorgeous landscape and insight into the plight of human existence. From the restoration notes: “Legend of the Mountain’s complete version is restored in 4K from a first generation vintage interpositive and from the sound negative preserved at the Taiwan Film Institute. The original camera negative, re-edited into a shorter theatrical version, was not assessed as the best source because it was completely damaged by mold, and the coiled film strips of some reels were sticky and glued together due to the decay of the support film base. The camera negative and some cuts from the negative were digitized in 4K for preservation purposes. This new 4K restoration, restored to its original three-hour running time, arrives on Blu-ray in an AVC 1080p encodement framed at its original aspect ratio of 2.35:1. The transfer does have some film softness due to both its age and the original production techniques, but there is still a lot of detail present and it looks very film-like and organic. 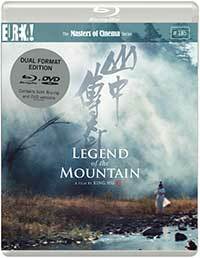 This edition of Legend of the Mountain comes to Blu-ray with the original mono mix in LPCM 1.0. This new restoration has done as good as it can, but ultimately the sound is very narrow and there’s a lot of clipping especially when the score kicks in. Screen Legend: The Magic of King Hu (1080p/24; 00:21:18) – A new video essay by critic and filmmaker David Cairns about the life and career of King Hu. Tony Rayns on Legend of the Mountain (1.78:1; 1080p/24; 00:21:28) – Asian-film expert Tony Rayns sits down for this new interview and offers his thoughts on this classic film. Collector’s booklet offering a wealth of archival writing on the film, King Hu, and images. Finally restored from its heavily edited theatrical release, Legend of the Mountain gets a wonderful new release on Blu-ray from Masters of Cinema allowing for a new generation of cineastes to contemplate this classic wuxia film and exam it anew. A young scholar, Ho Yunqing (Shih Jun, A Touch of Zen) tasked with transcribing a Buddhist sutra goes to an isolated mountain to complete his work where he crosses paths with a series of strange and mysterious people, including a beautiful musician named Melody (Hsu Feng, A Touch of Zen). He soon finds himself caught up in a cosmic battle between the forces of good and evil. This visually stunning horror-fantasy wuxia film from King Hu has been restored to its full three-hour length in a new 4K restoration for the first time since its original release.